Teri Ringham Health and Wellness | Is There Relief for Menstrual Cramping and Heavy Bleeding? Is There Relief for Menstrual Cramping and Heavy Bleeding? I’m cramping and bleeding because….? In a nutshell and simplistic summary, it’s extremely likely from estrogen dominance. Estrogen dominance contributes to almost every female hormone related condition today. Your doctor will likely disagree but your doctor hasn’t solved the problem, so take his/her emphatic opinion on this with a grain of salt. Estrogen dominance contributes to low progesterone. 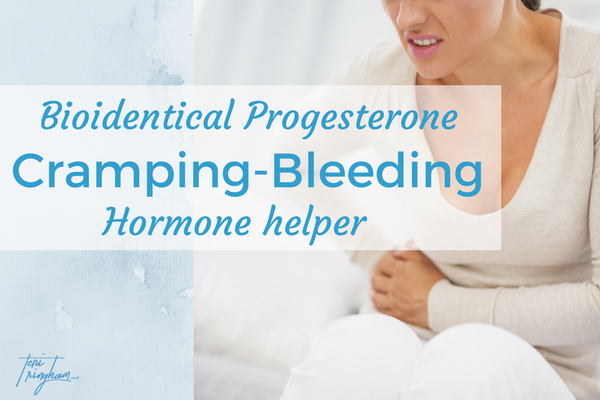 Progesterone is our “normal periods” hormone and our anti-cramping hormone. It’s also our “getting pregnant and avoiding miscarriages” hormone. It’s our “feel good” hormone and our protection against cancer hormone. Therefore, having low progesterone from estrogen dominance ends up affecting most of female functions. The list of benefits from our hormone, progesterone, is much more than what I’ve listed. But, for the benefit of this post, we’ll circle back to the fact that we must have normal progesterone levels to avoid fibroids, heavy bleeding, miscarriage, infertility, cramping and/or bleeding multiple times per month. This applies to anyone struggling….symptoms ultimately are a huge clue to what’s going on. If we look only at tests and focus on that answer, we could possibly be treating an “end result” of low progesterone rather than low progesterone. Bioidentical Progesterone…why hasn’t my doctor prescribed it? All of these symptoms and conditions beg for bioidentical progesterone. But it’s unlikely you will hear this at the doctors office–mainly because your doctor truly does not know what’s causing the problem. What our medical system knows is pills and surgeries. It’s what they are taught in medical school. If you currently struggle and have been to a doctor, see if that statement applies: pills and surgeries. AND…has it helped? My guess is no. We followed that path for 15 years. I have watched more women than I care to count follow that same path with the same poor results we had. We followed our doctors recommendation starting at age 12 years old for our daughter– with birth control pills that are synthetic hormones and most doctors “go to” for lack of anything better in their tool chest of “what doesn’t work”. We started with that one medication and, as time went on, more drugs (let’s not be kind and call them medication) being piled on top of each other. The end result is her “treatment” had increased to 12 daily doses (!) by the time she was 18 years old. Even worse, the symptoms and problems increased right along with the medications and surgeries. Each time, we were assured the next surgery or specialist would be our answer. After 15 years (yep-it took us that long) we finally had our wake up call. What we found is we had been unknowingly creating excess estrogen in our daughter–slowly but surely–with products loaded with fragrance and other chemicals. The result? The same result so many women today have: Xenoestrogens (powerful estrogen “mimickers”) that overload the body with estrogen. When the body is overloaded with estrogen, it attempts to “dispel” or “store” the excess by creating fat cells or fibroids to store it, cramping to try and dispel (excrete) it the vital organs/tissues. In my post on Chemicals and hormones, I discuss the effect of chemicals in products we use every day and their effect on our hormones to cause estrogen dominance. Reducing chemicals and foods with hormones (milk and diary-don’t believe the packaging that says no hormones–there are but that’s another story for another day) can make a big difference in settling disrupted hormones. Another help for getting relief is to “offset or balance” dominant estrogen, with bioidentical progesterone. There are natural health stores or websites such as John Lee’s that offer over the counter creams containing natural progesterone that may be effective. However, for ladies with extreme issues, there may be a need for something stronger. This is when you would visit a bioidentical doctor in your area. If you don’t have one or know one, Google your city and the words “bioidentical hormone doctor” to find one OR contact your local compounding pharmacy/Apothecary and ask them which doctors use bioidentical progesterone. Be sure you are given only bioidentical hormones and never prescribed synthetic progesterone-progestins. Progestins are synthetic steroid hormones (this is what most doctors prescribe) such as the prescription capsule Prometrium, generic Levonorgestrel or the powerful combo Depo-Provera . Bioidentical progesterone is a much safer and also much more likely to be effective than synthetic progesterone since it works more closely to our nautral progesterone. Bioidentical progesterone can come in a capsule, a cream or a troche (wafer) that goes under your tongue. The problem with a capsule form is that it must run through the digestive system which means you need a larger amount for similar results to other forms such as the troche/wafer or cream. I rarely hear of doctors, including bioidentical doctors, prescribing progesterone troches. And yet, it’s one of the most effective delivery methods and is the one that gave our daughter amazing results. If you have tried any form of bioidentical Progesterone with limited improvement, try again but ask for a bioidentical progesterone troche (wafer) compounded at the nearest Apothecary or compounding pharmacy. Relief can be obtained with lifestyle changes-such as removing all scents and chemicals from your life-and eating healthy. Progesterone supplementation might likely do near miracles for your female issues…for awhile. But without lifestyle changes, the debilitating symptoms will return. I love what bioidentical progesterone can do for a struggling female. But, keep in mind…it’s a band aid that helps us deal with estrogen dominance. It does not take away the cause of the estrogen dominance. Bioidentical Progesterone has potential to bring great relief but should not be a long term solution–we want our body to produce it’s own progesterone. As we change chemical exposure and diet to get away from the estrogenics in our environment, we can support the body to hopefully come to better hormone balance without the need for progesterone supplementation or medications. Simple changes can’t help my powerful symptoms? All is not lost. There is a cause for estrogen dominance. As you remove chemicals form your home and personal care products, while eating a healthier diet, you will be amazed how the nasty symptoms can reduce and possibly even resolve. To maintain balance and a pain free body, it’s necessary to look for a bioidentical hormone doctor to get a prescription for bioidentical progesterone for the short term. THEN…it’s all on you to make the effort to use chemical free products to avoid estrogen dominance. Just as important, is a diet with minimal or no sugar, gluten and dairy. Many women think there situation is different…they are “too far gone…to be helped with “simple” solutions such as removing chemicals or eating well, but it’s hard to imagine someone in worse shape than our daughter was. Yet today…no cramping and normal cycles. You’d be amazed how much these changes-that seem too simple–can contribute to reducing hormone imbalance and easing major inflammation (think chaos) in the body. Cramping, fibroids and heavy bleeding is the body trying to rid itself of excess estrogen. It’s a common occurrence in today’s environment. Unfortunately, the medical systems answer is birth control pills (synthetic hormones that contribute to increased hormone imbalance), narcotics, muscle relaxants and surgery. Waiting and praying for a “cure” from the next doctor/specialist appointment, test or surgery is not the answer. Not only have we personally “been there-done that and bought the tee shirt” for 15 years in our family, but I’ve worked with many females who have also had the same poor results from standard medical treatments yet had wonderful results with bioidentical progesterone and reducing estrogenic causing products from their lives. This, along with focusing on Insulin levels in your body can be the first step on the road to resolving hormone issues. If you are looking for more detail, I discuss all the information in this article further in my book Essential Gut and Hormone Wellness. There are times being a female is just no fun. Menstrual periods-for far too many females today-is one of those times. Have hope. If you do as discussed in this article, you likely can see encouraging change. Natural, bioidentical progesterone…it can often be an amazing help to many female issues. Pair this with removing chemicals and being more discretionary for what goes in and on your body….and you might just find being a female isn’t all bad. In fact, you might find– when you aren’t having to focus on pain and bleeding– being a female can be rather fun again. When it comes to what makes sense as well as works for female hormone conditions, I speak from my experience and from my heart 😉. Have you used bioidentical progesterone? Share your experience in the comments!